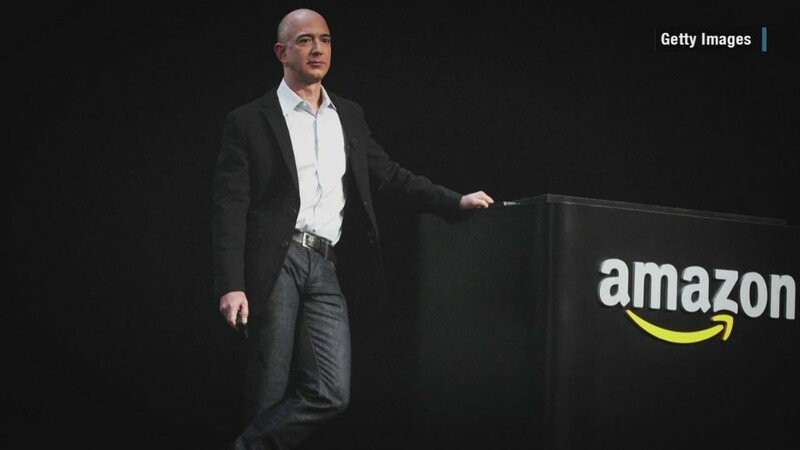 Amazon is taking on the apparel market in a big way. But you wouldn't know it by just looking at the website. The online retailer recently launched seven in-house fashion labels that sell a range of apparel and accessories for men, women and children. Amazon registered its new fashion brand trademarks in Europe through a Luxembourg-based subsidiary called Amazon Technologies. The trademarked brands are selling more than 1,700 different items on Amazon's (AMZN) U.S. website. One women's brand -- Lark & Ro -- is available on the Canadian site, Amazon.ca. Most of the clothing is priced below $100 and has only been available for the past few months. The labels do not give shoppers any clue that they're Amazon-controled brands. Amazon did not respond to CNNMoney's request for information about its new labels. 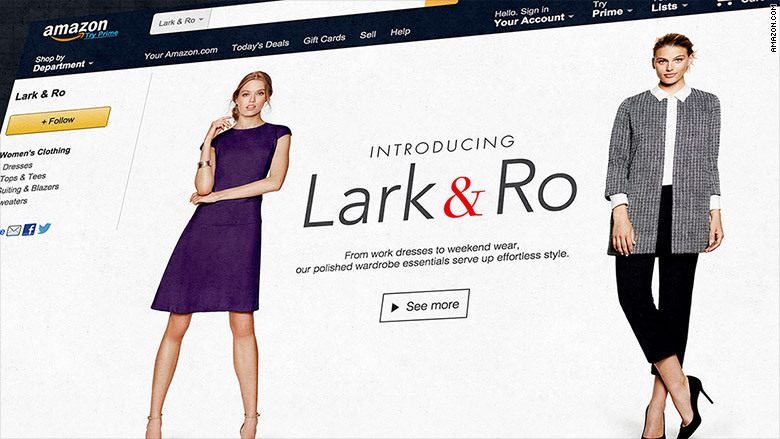 Amazon's new Lark & Ro brand has been available online for the last few months. Amazon has been bulking up its fashion business and partnerships for years and has promoted itself in high-end magazines to garner fashion cred. But not all customers may be keen to own Amazon couture. "Twelve years after entering the [fashion] category, Amazon's customer engagement in apparel remains low with only about 15% of Amazon's active customers shopping fashion," said retail analysts from KeyBanc Capital Markets in a research note. But these analysts forecast the new private brands could significantly increase Amazon's earnings over the next two years. They estimate that profit margins in Amazon's clothing business could be twice the industry average. "They're being very strategic about this," said KeyBanc's leading retail analyst Edward Yruma in an interview with CNNMoney. If Amazon is successful in this initiative, it could be "disruptive to the whole industry," he said. 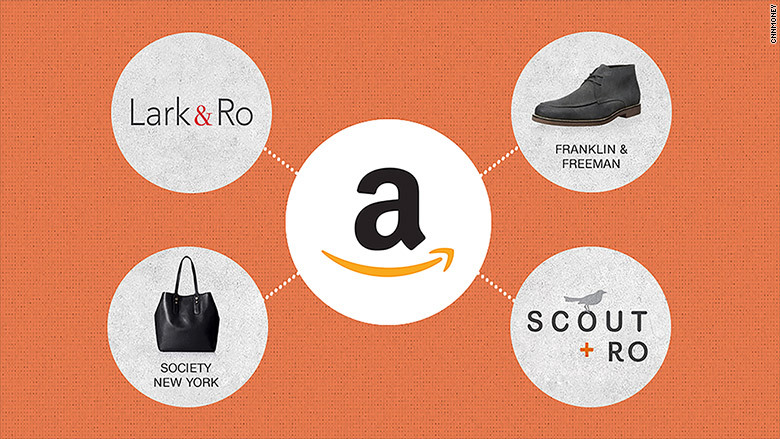 A selection of Amazon's new fashion brands. Yruma, who says he uncovered the Amazon fashion labels, isn't sure who is supplying the clothing to Amazon, but says the company has built up a "wide and deep community of suppliers" over the past few years. The U.S. clothing and accessories industry boasted $254 billion in sales last year and has been growing at a slow but steady rate, according to data from the U.S. Census Bureau. Amazon has been trying to get in on the game, making its first high-profile push into the market in 2009 when it bought online shoe retailer Zappos for about $850 million. More recently it has hired a number of top retail veterans, including former Vogue editor Caroline Palmer, and sponsored New York's first menswear fashion week in July 2015. 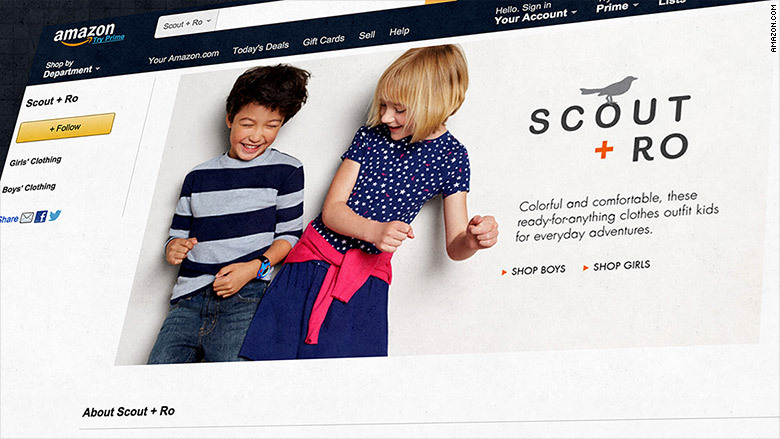 Amazon's Scout + Ro brand specializes in kid's clothing. Prices range from $5 to $30 per item.